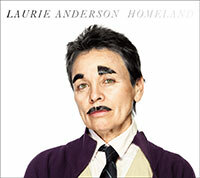 Homeland, Laurie Anderson‘s first studio album in nearly a decade, is finally available for airplay at your station. Anderson’s male alter ego, Fenway Bergamot, can be seen on the Homelandalbum cover and heard on the track “Another Day in America.” She also gets help from a cast of like-minded artists, including: vocals from Antony Hegartyand Tuvan throat singers, Four Tet’s Kieran Hebden on keyboards, Lou Reedon guitar, and John Zorn on saxophone. Give it a spin to see why Anderson’s considered one of America’s most provocative performance artists and musicians. Click here to read Pitchfork’s glowing 8.3/10 review of the album. Homeland is out on Nonesuch Records and is going for adds June 28 and 29. Check here for Anderson’s upcoming live performances.